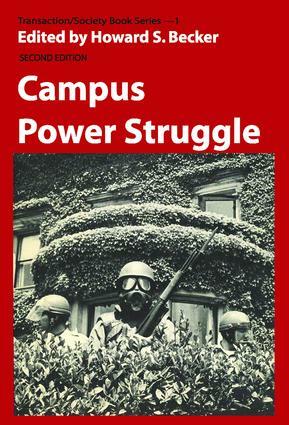 Campus Power Struggle traces the explosive evolution of the student political movement from the Berkeley Free Speech Movement of 1964 to armed confrontation at Cornell in 1969. From campus conflict as a microcosm of larger political struggles for self-determination, to student concern about infringements upon personal liberties, the studies in this book provide authoritative insight into unrest on American campuses. This volume represents sociology as the "big news" in its most impressive and involved style. No.l in the series.Contents: Introduction - The Struggle for Power on the Campus (Howard S. Becker). Beyond Berkeley (Joseph Gusfleld). Columbia: The Dynamics of a Student Revolution (Ellen Kay Tnmberger). The Crisis at San Francisco State (James McEvoy and Abraham Miller). Confrontation at Cornell (William H. Fried/and and Harry Edwards'). The Phantom Racist (Rita James Simon and James Carey). Dynamic Young Fogies-Rebels on the Right (Lawrence F. Schiff). Ending Campus Drug Incidents (Howard S. Becker). The Psychiatrist as Double Agent (Thomas Szasz). Student Power in Action (Arlie Hochschild). Becker, H. S. Introduction to the second edition.--Becker, H. S. Introduction to the first edition: the struggle for power on the campus.--Gusfield, J. Beyond Berkeley.--Trimberger, E. K. Columbia: the dynamics of a student revolution.--McEvoy, J. and Miller, A. The crisis at San Francisco State.--Friedland, W. H. and Edwards, H. Confrontation at Cornell.--Simon, R. J. and Carey, J. The phantom racist.--Flacks, R. Young intelligentsia in revolt.--Schiff, L. F. Dynamic young fogies--rebels on the right.--Drew, D. E. Jewish students today: radical or conservative.--Becker, H. S. Ending campus drug incidents.--Szasz, T. The psychiatrist as double agent.--Hochschild, A. Student power in action.--Notes on contributors.